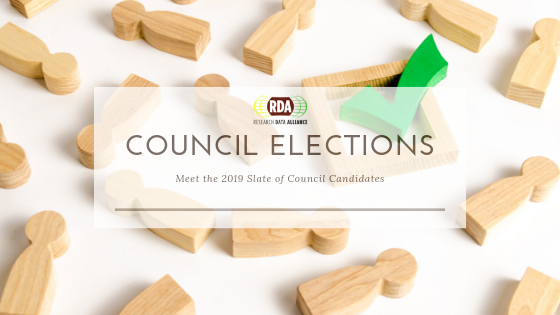 A formal election process will take place between 2 and 16 April 2019 where RDA members will be asked to either accept or reject this slate, with results being determined by a simple majority vote. Meet the 2019 Slate of Council Candidates here! The Research Data Alliance (RDA) is a community-driven organization whose mission is to develop the social and technical data infrastructure needed to drive innovation surrounding data sharing and data interoperability. Established in 2013, RDA supports more than 8,000 international members representing 137 countries, has generated 30 concrete outputs (eight of which are recognized as European ICT technical specifications) with over 75 documented adoption cases (Feb 2019). The Research Data Alliance enables data to be shared across barriers through outputs developed by focused Working Groups and Interest Groups, formed of volunteer experts from around the world and drawn from academia, private sector and government. Participation in RDA is open to anyone who agrees to its guiding principles of openness, consensus, balance, harmonisation, with a community driven and non-profit approach. RDA has a grass-roots, inclusive approach covering all data lifecycle stages, engaging data producers, users and stewards, addressing data curation, exchange, processing, and storage. It has succeeded in creating the neutral social platform where international research data experts meet to exchange views and to agree on topics including social hurdles on data sharing, education and training challenges, data management plans and certification of data repositories, disciplinary and interdisciplinary interoperability, as well as technological aspects.